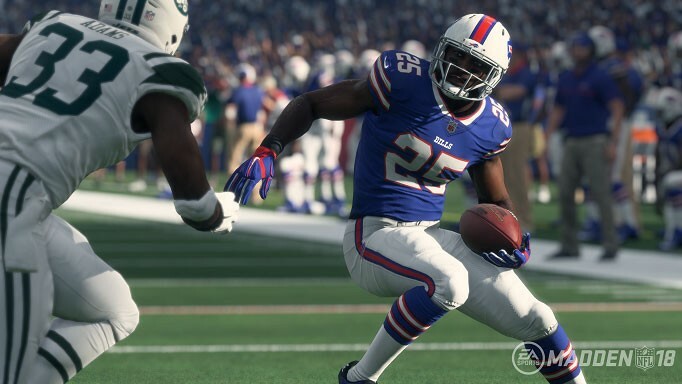 Madden NFL 18 delivers many new features. There’s Longshot, Game Styles, Coaching Adjustments, and Target Passing, to name a few. But along with all these features, Ea also wanted to improve the game on all fronts. With that, here’s a list of some of the Madden community’s most-requested tweaks, and how they were improved. When playing Simulation, players not directly involved in the tackle can be injured. This includes offensive and defensive linemen. You’ll want to stay on top of the injury report. When an off-ball injury occurs, you won’t see an injury animation on the field – only the injury notification under the scoreboard. In some cases, you may see the injury notification after the play, but before the sideline can report on the severity of the injury. The player may have already returned to the game. Users on defense can no longer hold ‘Y’/Triangle for the entire play on defense and expect to make the interception. Ballhawk is now a timing-based skill. If the button is held down or pressed for too long, the defender will receive a heavy penalty to his chance of making the catch, and will likely drop the ball. You’ll see a user-skill notification pop out of the scoreboard to tell you if the mechanic was timed correctly or not. Quarterbacks can also fake out user defenders holding ball hawk with a pump fake. Hit Stick has been moved back to be exclusively on the Right Stick. Defenders will no longer be able to use the Aggressive Tackle mechanic on X/Square to land hit sticks. It’s now based on timing and facing angle, with more risk and reward. It also brings back the ability for low, or high hit sticks by flicking the stick down or up respectively. Landing a hit stick will be accompanied by a controller-rumble and unique tackle audio. Every one of the ball carrier special moves – such as Juke, Spin, and Hurdle – has been updated in Madden 18. The moves are faster and more efficient. The moves are also less punitive in terms of fumble chances and, most importantly, user-controlled players on defense can now be faked out as effectively as AI-controlled players, especially when attempting to Hit Stick. Dating back many years, one of the top competitive complaints was around defenders dropping wide open interceptions. With the Competitive Game Style, if your defender has a good Catch rating and is open, there will be a significantly higher chance the interception will be caught. Keep in mind, you’ll still see dropped interceptions in this scenario if the defender’s Catch rating does not meet the threshold. Catches in traffic can also still result in dropped picks. Last year, an exploit was uncovered that allowed receivers to “swerve” defenders out of position to play the ball. The team has fixed several assignment and positioning issues to ensure that this tactic is no longer effective. Defenders will play the ball effectively, instead of locking in with the receiver. Another top community request was Curl-Flat (purple) zones. Curl-Flats would crash to the flats and leave deeper routes open down the sideline. We implemented a new rule called “No Cover Zone,” where underneath defenders won’t jump routes five yards and under. A big legacy issue we focused on was fumble recoveries. We eliminated the extended piles where nobody can recover the ball. You will see much faster reactions to the ball on the ground, and players have an improved ability to grab the ball when it gets close to their hands. Users controlling a linebacker were able to take away most routes over the middle of the field in the past. We made some alterations to defender run curves and turn rates to ensure that only elite defenders are capable of making these types of plays. Lower-rated defenders will not be able to take away the middle of the field as effectively. Dropped open RACs was one of the biggest technical issues we dealt with on Madden 17. Our online team worked on this area extensively with the gameplay team to ensure the problem is resolved in Madden 18. We also did a lot of tuning to the organic knockout system, to ensure fewer cases of dropping a catch due to collision once the ball has been secured. Our QA team has spent countless hours of online testing to ensure we deliver expected outcomes. The community stated that they wanted hard flats to play the flats more aggressively. We did some work on their logic so they do a better job of reading the route progression and taking away throws to the flats. Another top competitive community request was to remove outcomes where defenders would swat down what would have been an easy interception. On Competitive only, defenders will now always go for the INT on an open read on the ball. Since the implementation of the RAC catch, a player running out of bounds on a throw to the flat was a common occurrence. This year, we added branch out windows that allow you to steer the exit angle of your RAC catches. Simply push the left stick in the direction you want to exit the catch while in the RAC animation. Throwing towards the sidelines, push up on the left stick during your catch to immediately turn upfield and avoid running out of bounds. The formula used to determine the outcomes of Hit Sticks and impact blocks will now use weight and momentum of the players involved in the interaction. You will see far less instances of smaller players successfully landing a hit stick on bigger ball carriers, or wide receivers impact blocking bigger linebackers, especially when not moving with enough speed to make a big hit. Offline Play Now games now use playoff OT rules rather than regular season OT rules. Complaints about lower-rated QBs being too accurate have been addressed with a new inaccuracy system. Expect to see more inaccurate throws from lower-rated QBs, especially on simulation play style. These inaccurate passes have new placement modelling, ensuring you will see a wider variety in how throws are missed. When a user is on defense, in Practice, the AI will not snap the ball if it senses the user making defensive adjustments. This gives plenty of time to practice exotic defensive setups without having to be worried about the AI quick-hiking them. The game in the past could create scenarios where ball carriers on breakaway runs could be caught from behind by defenders with lower speed. We were able to solve this long-standing legacy issue with some key changes to defensive run curves and stamina. The hot routes available for defenders at the LOS are now position specific to each player on the field. Users should now see defensive hot routes that make sense for the position they are hot routing. This change provides a variety of new tools they can use to adjust their defenders when at the LOS. A breakdown of the new defensive hot routes on a per position basis is shown directly below. Notes – If a safety is subbed in via formation package, or formation sub to an outside cornerback position, he will get the outside cornerback hot route set. If by alignment an outside cornerback was to align inside over a slot receiver, he is considered a slot DB. Therefore, he’ll get the slot defensive back hot route set.